Venture on Marlette is Neighborhood Venture's second crowdfund offering. The company's first offering in Tempe, Venture on Wilson, closed in June 2018 and had a total of 104 investors and raised $500,000. PHOENIX, AZ, October 19, 2018 /24-7PressRelease/ -- On the heels of its first successfully funded project, Arizona-based real estate crowfunding company Neighborhood Ventures has announced its second investment opportunity. Thanks to new laws that have opened up commercial real estate investment to non-accredited investors, Arizona residents can now invest a minimum of $1,000 in projects once available to only the wealthy. Neighborhood Ventures is the first Arizona company to offer commercial real estate investment opportunities to non-accredited investors. 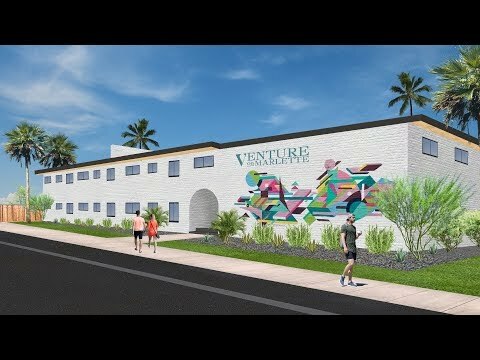 The company's new project, Venture on Marlette, is a 12-unit apartment complex with two and three-bedroom units located at 813 E Marlette in the popular Midtown Phoenix neighborhood in North Central Phoenix, on Marlette Avenue, west of 7th Street. "Just 3 days after announcing the Venture on Marlette project to our current investors, we had over 50 investors participate and have already raised 1/3 of our target amount," said Neighborhood Ventures co-founder Jamison Manwaring, a former technology analyst at Goldman Sachs and former VP of investor relations for Lifelock. "It's clear there's a strong demand for crowdfunding projects that let people invest in their communities." "Venture on Marlette is an ideal investment for multiple reasons," says John Kobierowski, Neighborhood Ventures co-founder and managing partner of ABI Multifamily, a leading commercial brokerage in Phoenix. "Midtown Phoenix is quickly becoming an urban hot-spot after undergoing remarkable rejuvenation with many new restaurant and retail venues. With a much-needed face-lift and some modernizing touches, we will bring up the value of this ideally situated apartment complex." The company's first investment opportunity, Venture on Wilson which closed in June 2018, is a 12-unit apartment project in downtown Tempe. A total of 104 people invested $500,000 in the purchase of this apartment complex near Tempe Town Lake. Remodeling is currently underway, with sale of the property slated for 2021.